3 Replies Latest reply on Mar 9, 2018 4:40 PM by J. R.
As you can see, the Z value is 45 degrees, yet the model is not rotated. 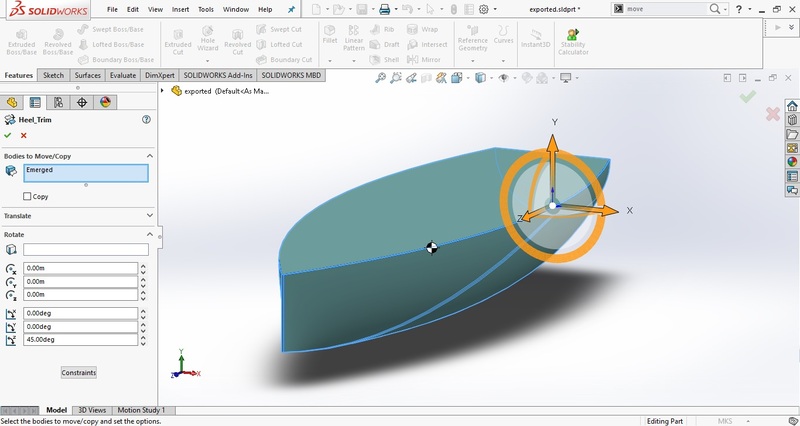 If I try to click OK, I get a message saying "Please define either a translation or a rotation", which kind of implies that Solidworks doesn't recognize that value. I tried rebuilding, force-rebuilding, but it's still won't rotate the model. Interestingly enough, if I use the exact same code to define translation (skipping the swMoveCopyBodyFeatureTransformType_e.swTransformType_Rotation), then everything updates perfectly. I'm sure I'm missing something obvious here, but I can't figure it out. Could anyone help, please? I can't see that you have called swMoveCopyBodyFeatureData.AccessSelections anywhere. That needs to be the first call before modifying any parameters. If you don't mind me asking, is there a faster way to read/write values of the move-copy feature? The way I'm doing it makes the model roll back and then roll forward again. It takes a lot of time compared to a simple rebuild. What can be done about it?